With release Vanilla 4 rc2 (mid-december), we will provide one of the last piece of Web module that makes Vanilla the most comprehensive Open Source Bi platform : our new WebDashboard Designer, now supporting our Performance Dashboard Template, and making intensive use of Vanilla resources surch as FreeMetadata documents (version 4 rc1 only support standard Dashboard based on Vanilla dictionaries). Basically, FreeDashboardWeb is now very close – in terms of interface – from FreeWebReport/Wysiwyg, sharing a common set of widgets and features, which makes its use more easy for Web users. 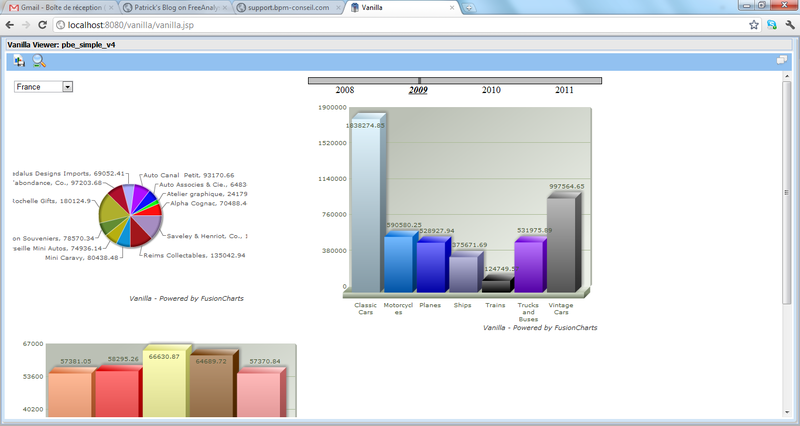 FreeDashBoard documents, like other Vanilla documents (Birt Report, IReport report, UnitedOlap View) are available from Vanilla portal (or any VanillaViewer compliant portal) using VanillaViewer, or standard component that provide standard functions to all documents (such as OpenOffice Export, Office Export, Pdf export, Xml export …). 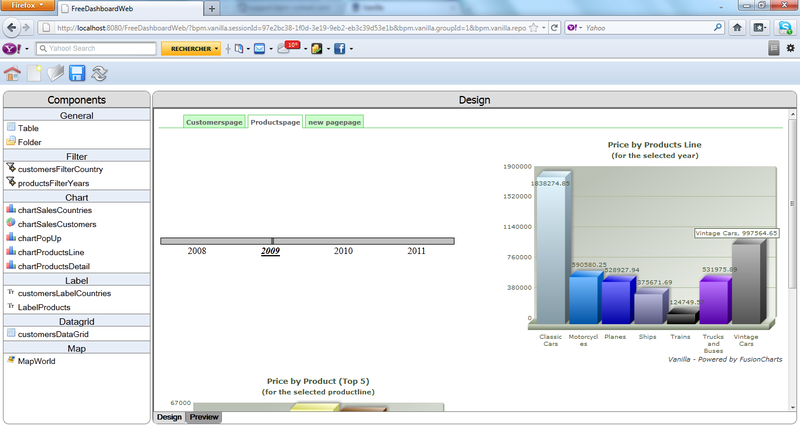 You can see below the result of a Dashboard that I design using FreeDashboardWeb (in less that 10 minutes). We are now 50 days before official launch … and situation is so pleasant with Vanilla v4. All the modules are under control, and we have even added new features for our Olap package (simulation, new improved AddIn Excel, …). Last package to be released is VanillaPlace, a new environnement to make deployment easier (soon I will post on this subject). We invested time to write documentation, to test & correct the new packages … Vanilla v4 sounds already like a “must-to-have” in the Bi area, with arguments do compete with commercial platforms. First feedback we received from Vanilla v4 are so pleasant … we reached our objectives and our target ! With the new Vanilla v4, we have done our best to help developers starting with Vanilla, by providing additional “ready to run” or “ready to download” Vanilla platform. Vanilla v4 rc1 is available now for download, and this is a first big step toward the public availability for version 4, forecasted for mid-january. Well, all is not perfect, as we originally wanted to make rc1 available in october, but this additional delay give us time to add some of the new features we originally wanted to publish in rc2. – UnitedOlap, a new high-performance Olap engine providing the ability to design your cubes on different data sources (even excel) and featuring an advanced cache system to speed your cubes. – Advanced clustering and load balancing for the VanillaRuntime, spread your tasks and treatments across different vanilla’s. – A brand new portal, faster and leaner. – And many more improvements to overall user experience. There is something certain with Vanilla Apps : it’s growing every week, in terms of new supported platform (application & database), new document (more dashboard, more report, more cube, more Kpi) and in terms of architecture, because we have migrate to UnitedOlap engine. What does it means ? 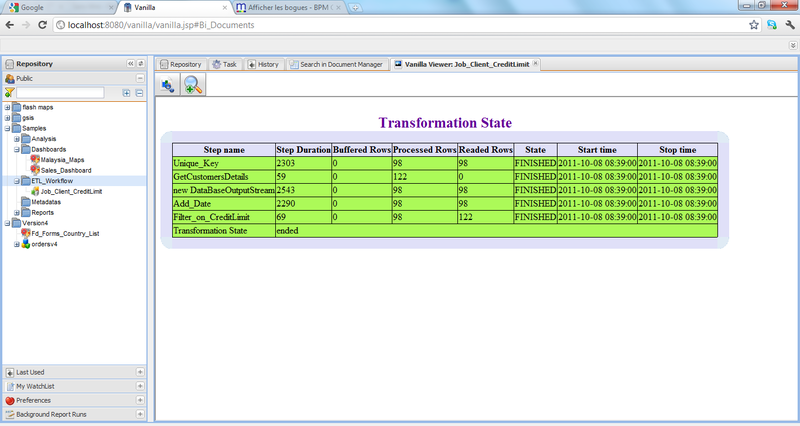 … simply we can now delivere cube ready to run on production database, breaking the limitation of our old olap driver that supported only 1-column join strategy (it was not usable with production database, where join strategy is multi-column with snowflake schemas) … package “ready to deploy” that provide Bi on production database ! But most important with Vanilla Apps is now the number of platforms covered, as we provide now 11 : Mantis, OpenBravo, Glpi, VTiger, SugarCrm, OrangeHrm, GoogleAnalytics, Nagios, Cocktail, DotProject and Vanilla (itself). I’m certain most of you have already deployed 2 or 3 of those applications and would like to deploy standard Bi documents (available on Tablets & Smartphone), as opposed to managing report & dashboard for each application. Now, next step is to improve the way we delivere Vanilla Apps, because we understand it’s sometimes difficult to have access to information about new document, new update, or even new Apps. This will be one of the new features that will come with Vanilla v4 : tools & methods to deploy Vanilla Apps using Enterprise Services … just keep in touch, I will provide soon the first screen shot of this new feature.